With the growing influence that technology has played in our lives we have seen an explosion in the number of Identity Theft crimes in our society. Whether it be on our computers, tablets, or cell phones, we share more and more of our personal information over the internet. Sometimes, we don't even know that our personal information is being shared. This use of modern technology has made it easier for criminals to steal our identity and use our personal information to impersonate us and obtain credit and goods using personal information stolen over the internet. In response to the growing number of Identity Theft events, we have seen a growing number of criminal prosecutions involving Identity Theft crimes throughout the country. This is especially true of Identity Theft crimes in Illinois. In recent years, the Illinois State Legislature has updated existing statutes and enacted new statutes and laws to deal with growing instances of Identity Theft crimes. In addition to the new and updated laws dealing with Identity Theft in Illinois, most police agencies in Chicago, Cook County, DuPage County, Kane County, and Lake County have become much more experienced in developing the technological skills and expertise needed to properly investigate, and prosecute, Identity Theft crimes in Illinois. With the growing number of criminal prosecution in Illinois for Identity Theft we also see a growing number of people innocently charged with the criminal charge of Identity Theft. Many of them are themselves innocent victims of Identity Theft who find themselves wrongfully accused of committing the crime of Identity Theft. Identity Theft lawyer, James Dimeas, is a nationally-recognized, award-winning expert in defending people charged with the crime of Identity Theft. Identity Theft attorney, James Dimeas, is a published author and has been interviewed and quoted in several nationally-published news stories and periodicals about Identity Theft crimes. In 2012 James Dimeas was chosen to write the 1st Chapter of a book published for lawyers to help instruct and teach them about how to properly handle cases for defendants charged with the crime of Identity Theft. 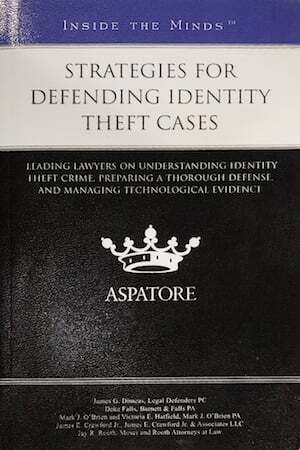 The book is "Strategies for Defending Identity Theft Cases: Leading Lawyers on Understanding Identity Theft Crime, Preparing a Thorough Defense, and Managing Technological Evidence (Inside the Minds). This book was published by Thomson Reuters, one of the leading publishers of books for the legal profession. If you are being investigated for an Identity Theft crime, it is important that you call the nationally-recognized Identity Theft lawyer, James Dimeas, to discuss your case immediately. Many times, James Dimeas is able to talk to the police and to investigators early in the investigation to clear up any possible confusion before you are actually charged with the crime of Identity Theft. Do not talk to the police if you are under investigation for an Identity Theft crime. Instead, you should call Identity Theft lawyer James Dimeas first, at 847-807-7405, before talking to the police. What is Identity Theft in Illinois? When you use another person's personal identifying information to commit any other felony. The felony he does not have to involve money, credit or goods. Creating a fake personal identification document knowing that it will be used to commit any felony or to be used to gain access to anybody's personal information. An example would be a fake ID. Possessing document-making implements that are used to make false and fake documents that can be used by the person who is making the false and fake documents to commit any felony. Using another person's personal identification information or document to portray himself as that person so then they may gain access to that person's personal information. If the victim of the crime was 60 years of age or older, or if the state is able to prove that the Identity Theft crime was part of an organized gang, you could be charged with an Aggravated Identity Theft. Aggravated Identity Theft is a much more serious felony than regular Identity Theft. It is not a defense to an Aggravated Identity Theft that you did not know that the victim was 60 years old or older. If the amount of the money and goods stolen in the Identity Theft crime is less than $300, the crime is a Class 4 felony which carries a possible prison sentence of between 1 to 3 years but can also carry probation. If the amount is over $100,000, then the charge could be a Class X felony which carries a mandatory prison sentence of six years and does not allow for probation. Any other amounts involved in the crime of Identity Theft between $300 and $100,000 can be anything from a Class 3 to a Class 1 felony. Identity theft also comes under the general umbrella of a Theft crime. In addition to the severe possible criminal penalties associated with the Illinois crime of Identity Theft, it's a crime involving truth and dishonesty and it's the kind of crime that if it ever comes up in a background search could make it very difficult, if not impossible, to get a job. Because of the serious consequences involved with a criminal charge of Identity Theft in Illinois, it is critical that you hire an Identity Theft attorney, like James Dimeas, that has the extensive experience with such a difficult and complicated crime so as to give you the best chance of winning your case and keeping it off of your record. Chicago Identity Theft Criminal Defense lawyer, James Dimeas, has spent more than 26 years representing individuals charged with Identity Theft crimes throughout Chicago, Cook County, DuPage County, Kane County, and Lake County. Identity Theft Criminal Defense Lawyer, James Dimeas, has been nationally-recognized as a leading expert in the defense of Identity Theft crimes. James Dimeas is a published author on the subject of Identity Theft crimes and has been interviewed by local and national media for investigations involving Identity Theft crimes. James Dimeas has the unparalleled knowledge and experience with Identity Theft crimes in Illinois that makes him one of the leading attorneys in the defense of Identity Theft criminal cases in Illinois. Most cases involving the prosecution of Identity Theft criminal charges are handled by prosecutors who have specialized training and knowledge about handling such cases. These special prosecutors are specially trained to handle complex cases involving Identity Theft. It is critical that the attorney representing you in an Identity Theft criminal prosecution possesses the similar specialized knowledge that the prosecutor on your case will possess. With his 26 years of experience, and nationally-recognized skills, Identity Theft lawyer, James Dimeas, is just the Identity Theft attorney you need on your side to defend you in court. Expertise named James Dimeas a "Best Criminal Defense Lawyer in Chicago." Attorney and Practice Magazine gave James Dimeas the "Top 10 Criminal Defense Attorney Award for Illinois." The National Academy of Criminal Defense Attorneys gave James Dimeas the "Top 10 Attorney Award for the State of Illinois." Recently, the American Society of Legal Advocates named James Dimeas a "Top 100 Criminal Defense Lawyer In the State of Illinois For the Year 2018 and 2019." James Dimeas was recognized as a "Best DUI Attorney." The National Trial Lawyers named James Dimeas a "Top 100 Criminal Defense Trial Lawyer." The American Institute of Criminal Law Attorneys recognized James Dimeas as a "10 Best Attorney for Client Satisfaction." AVVO rates James Dimeas as "Superb", the highest rating possible for any Identity Theft lawyer in the United States. James Dimeas is a leading Identity Theft criminal defense attorney. You can contact James Dimeas for a free and confidential consultation about your Identity Theft criminal case. You can speak to James Dimeas personally anytime at 847-807-7405 to discuss your criminal case. If you are being charged with Identity Theft crime in Chicago, Cook County, DuPage County, Kane County, or Lake County, get in touch with James Dimeas to discuss your options.